Chester FC lost their third National League North game in a row, after a 4-1 defeat to Kidderminster Harriers at Aggborough. The Yellows took the lead as the returning Akwasi Asante tucked home his sixth goal in four Blues appearances, before strikes from Declan Weeks and Joe Ironside completed a quick turnaround shortly proceeding the break. Ryan Johnson added a third with 70 minutes played and Harriers top-scorer Ed Williams struck home from distance to add insult to injury. Chester made four changes to the lineup that lost 2-0 to Spennymoor two weeks ago. Ben McKenna, Bradley Jackson, Sean McAllister and Simon Grand were all ruled out to further worsen the Blues’ injury woes. Despite this, managers Bernard Morley and Anthony Johnson were handed a boost with the return of Anthony Dudley and club-record signing Asante as starters. Craig Mahon and Matty Waters also came in. A quiet opening ten minutes consisted of solely Kidderminster deliveries, none of which caused major problems for the Chester backline, although full-back Sam Austin forced one to be clawed away by Grant Shenton. Shortly afterwards, the travelling Yellows earned their first corner – a fantastic cross from Waters was knocked on by George Waring before Mahon had his delivery blocked. The set piece came to nothing. Waring was back in the thick of the action but this time saw himself cautioned for a second successive foul in as many minutes. The hosts then continued to dominate possession, Ironside lashed over the first shot of the contest on 21. Next, a phenomenal piece of link-up play between Joel Taylor and Liam McAlinden on the left-side of the penalty area allowed the latter to flash a low ball across the face of Shenton’s goal but this was wide of the far post by mere inches. Then Nick Clayton-Phillips was next to try his luck but, forced onto his weak foot, dragged his effort wide. Matty Thomson was then next to enter the referee’s notebook for dragging back McAlinden who was breaking away. The Seals added to their corner count but neither of Waters’ two deliveries created a significant opportunity. But with 37 minutes on the clock, they drew first blood against the run of play. On his return from injury, Asante tucked a delicious Dudley through ball beyond Brandon Hall, his sixth goal in four Blues appearances and first since the loan deal from Tamworth was made permanent. The lead would only last five minutes, though. Despite the visitors looking brighter since taking the lead, a Harriers cross to Ashley Chambers at the back post was nodded towards Weeks who exceptionally guided the ball into the top corner on the half-volley. The hosts then completed their turnaround in first-half stoppage time. The towering Ironside acted quickly from a corner to head beyond Shenton, after Kidderminster had threatened with their deliveries throughout the opening 45 minutes. A crushing blow after gaining the lead just a few minutes beforehand. The Worcestershire side aimed to continue their hot streak following the restart, Weeks and McAlinden stood over a free-kick before the latter curled off-target from 25-yards. Milan Butterfield fired wide of the post moments later after Clayton-Phillips had worked the ball and subsequent lay-off well. Dudley smashed a powerful effort from 30-yards into the arms of Hall, with Danny Livesey’s diving header as successful shortly afterwards. McAlinden continued to trouble the Yellows, his cross a peach but a mistimed stretch from Ironside denied Kidderminster another. The Harriers kept pressing, though, and eventually got their deserved third after 70 minutes. Another delivery caused problems for Shenton and the Blues stopper could only parry the ball into the path of Johnson who side-footed home. This was followed by the hosts’ fourth just before injury time, as top-scorer Williams drilled an effort low into the back of the net. 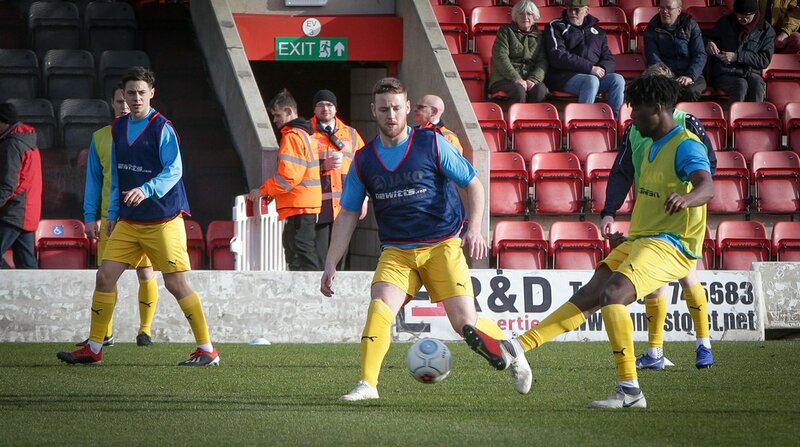 That was all she wrote at Aggborough, as Chester succumbed to a disappointing defeat on their travels. The Seals welcome Boston United to the Swansway next Saturday, 3pm, as they aim to bounce back on Junior Blues Takeover Day. CHESTER: Shenton, Thomson, Waters, Roberts, Livesey, Howson, Dudley, Burton, Asante (Mooney 78), Waring (Marsh-Hughes 68), Mahon. SUBS NOT USED: Smalley, Murray, Brown.